How do you rate your present state of health? 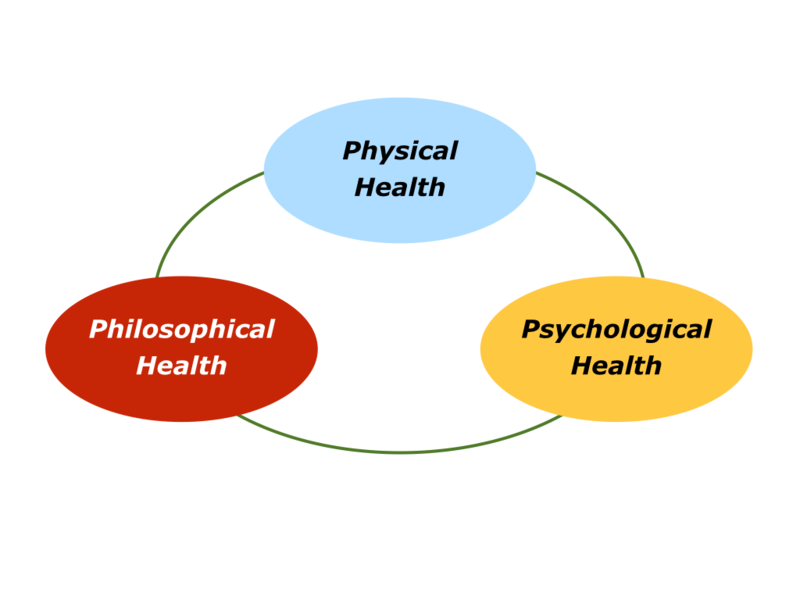 There may be several aspects to consider, such as your physical, psychological and philosophical health. We all want to care for our wellbeing, but sometimes we get wake up calls. You may carry a cold for months, feel emotionally exhausted, lose a sense of purpose or whatever. Then it may be time to reassess our lives and work. Let’s explore how you can maintain the various aspects of your health. On a scale 0 – 10, how do you rate your physical health? Nowadays many people take more responsibility for their bodies. They exercise, eat better food and go for yearly check ups. “My wake up call came three years ago when climbing several flights of stairs. “After the second flight I suddenly felt out of breath. This was something I had not been aware of before, probably because I normally took lifts. “My professional life consisted of flying twice a week, eating unhealthy snacks and doing little exercise. There were two options. “I could carry on with the same schedule, which would mean getter fatter. Or I could take care of my body. I chose the latter. “This called for developing a sustainable lifestyle, rather than a crash programme. So I began running on weekends and slowly increased the exercise. “During the day I grazed on regular healthy snacks, rather than eating heavy meals at lunch and the evening. 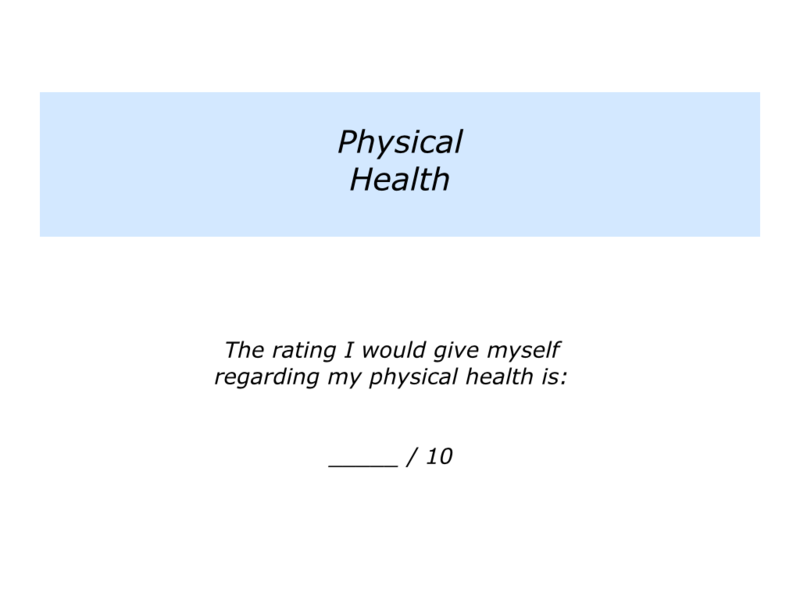 Rate your physical health on a scale 0 – 10. On a scale 0 – 10, how do you rate your psychological health? Do you have a positive attitude? Do you have encouraging people around you? Do you have fulfilling work? “A great breakthrough for me came when learning about the concept of controlling the controllables. Laurens van der Post, the South African writer, related a story about the importance of control when describing his time as a prisoner of war. One night he was informed he would be executed the next morning. Gathering his courage, Laurens said he asked if he could choose the method of his death. He preferred to be shot, rather than beheaded, a request that was granted. So how is your psychological health? Do you enjoy life? Do you have a sense of autonomy? Do you get enough stimulation? Are you able to recover from setbacks? 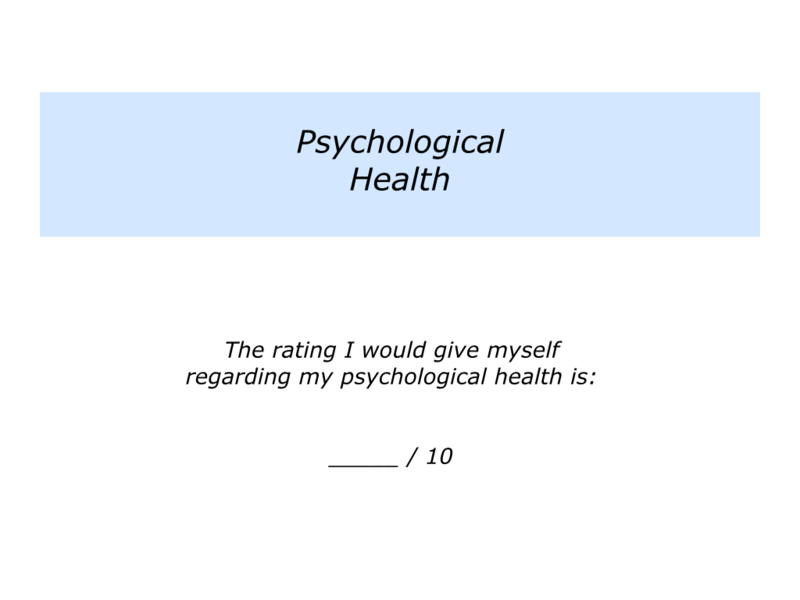 Rate your psychological health on a scale 0 – 10. On a scale 0 – 10, how do you rate your philosophical health? Do you have a sense of purpose? Do you feel true to yourself? Do you have clear life goals? Do you do something each day to work towards your picture of success? Everybody wants to enjoy a sense of meaning in life. Sometimes this comes from working to improve the quality of their lives, encouraging their children or making a positive difference in the world. Sometimes it comes from serving something greater than themselves – be it following a faith, a calling, a tradition or whatever. People like to see a connection between the actions they take each day and pursuing their overall purpose. Looking at your own life, how can you continue to make this link? There are many things people can do to maintain their physical, psychological and philosophical health. You will, of course, do this in your own way. Rate your philosophical health on a scale 0 – 10.